Rowling took to Twitter to post a picture of the meeting, where Trump can be seen staring at the floor with his lands locked between his knees. NEW YORK: Celebrated author J K Rowling has never been one to mince words, especially when it comes to Donald Trump, and the Harry Potter creator once again trained her witty guns on the President over his infamous 'awkward' photo-op with German Chancellor Angela Merkel. Rowling took to Twitter to post a picture of the meeting, where Trump can be seen staring at the floor with his lands locked between his knees, while Merkel looks at him with an undecipherable expression. 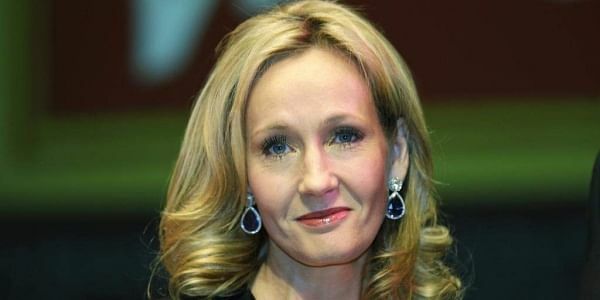 Rowling has previously defended her right to criticise the Trump regime, despite not being an American citizen, arguing, "When a man this ignorant & easy to manipulate gets within sniffing distance of the nuclear codes, it's everyone's business." In a photo op after their Oval Office meeting yesterday, the two leaders sat next to each other in separate chairs. Merkel could be seen leaning towards Trump, who sat with his hands firmly locked between his knees, a very 'un-Trump' like gesture. Merkel then appeared to ask the President if he wanted to shake hands, which is customary in photo ops, but Trump simply did not respond. He barely even looked at his German counterpart while quickly answering a few questions from the press. Trump's tensed up body-language during the photo-op and his refusal to shake hands with Merkel has not gone down well across the globe, as he was chastised for the incidents and many branded his behaviors as rude and "un-President" like. "Send a good picture back to Germany, make sure," Trump jokingly told photographers, adding that his meeting with the Chancellor was "very good" and said the pair talked about "many things." However, when asked to shake hands by reporters and photographers, Trump and Merkel remained stationary. It wasn't clear if the two heard the request, and the two had shaken hands when Merkel arrived at the White House and they shook hands again after a White House news conference. By contrast, the President did shake hands with Canadian Prime Minister Justin Trudeau and Japanese Prime Minister Shinzo Abe when they recently visited him in the Oval Office, which incidentally did provide great fodder to memesters.